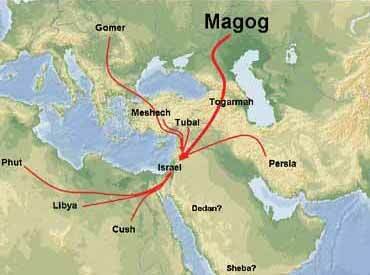 Ezekiel Chapters 38 and 39 describe the occasion in which God Himself intervenes to quell the ill-fated invasion of Israel by Magog and its allies (Persia, Cush, Phut, Libya, Gomer, Togarmah, Meshech, and Tubal). This passage also appears to anticipate the use of nuclear weapons. Why does the Bible use such strange names? It has to - we keep changing the names of things: Petrograd = St. Petersburg = Leningrad = St. Petersburg again. (My friends in Russia remind me that ''in Russia, even the past is uncertain!'') Byzantium = Constantinople = Istanbul. Cape Canaveral = Cape Kennedy, etc. But we dont change the names of our ancestors! Herodotus of Harlicarnassus, known as the ''Father of History,'' wrote extensively about the descendants of Magog by their Greek name, the Scythians, in the 5th century B.C. Flavius Josephus records that Magogians were called ''Scythians'' by the Greeks. Philo, in the 1st century, identifies Magog with southern Russia. One reason Herodotus gave so much detailed information about the Scythians was that he wanted to describe the people who had succeeded in defeating the Persian king, Darius. Darius I crossed the Bosporus and invaded Scythia. The Scythians, however, had devised an unusual tactic for conducting warfare. The Persians expected to crush the Scythians in a decisive engagement, but the Scythians avoided such a battle. They retreated deep into their own territory, laying to waste the region and wearing down the enemy by means of small raids. In pursuing the Scythians, Darius soon came to appreciate the cunning of these ''partisan'' tactics: Reaching the Volga, Darius, acknowledging defeat, had to retreat from Scythia in shame. In 1812, when Napoleon entered Russia, Field Marshall Kutuzovs similar strategy - including the sacrifice of Moscow itself - resulted in reducing Napoleons Grande Arme from 453,000 to less than 10,000 and yielded the infamous defeat now commemorated in Tchaikovskys Overture of 1812. In 1941, Hitler suffered a similar defeat from the same Scythian strategy: pressing a quick advance deep into the Russian interior only to have his Wehrmacht swallowed up in the harsh Russian winter. All the allies of Magog are in position, except one (watch Turkey!). Af-ter nearly two decades of waiting, Turkey has finally begun official negotiations for admittance into the European Union. The two largest impediments to Turkeys EU membership are its predominantly Muslim population and its refusal to recognize the island nation of Cyprus (an EU member). This could push a wounded Turkey back into the arms of the nationalists and hard-line Islamic fundamentalists. Modern Russian history dates from before the fall of the USSR - beginning with Yuri Andropovs rise to power in November 1982. As someone who was in charge of the KGB, in a state where information was tightly compartmentalized, Andropov came into office knowing something that would not become apparent to the rest of the world for years: Not only was the Soviet Union losing the Cold War, but it was dangerously close to economic collapse. The West had long since surpassed the Soviets in every measure that mattered: from economic output, to worker productivity, to military reach. Andropov was convinced that, in time, Moscow would fallbarring a massive change in course. Andropovs plan was to secure money, managerial skills and non-military technologies from the West in order to refashion a more functional Soviet Union. But the Soviets had nothing significant to trade: they did not have the cash, they lacked goods that the West wanted, and Andropov had no intention of trading away Soviet military technology (which, even 15 years after the Cold War ended, still gives its U.S. counterpart a good run for its money). In the end, Andropov knew that the Soviet Union had only one thing the West wanted: geopolitical space. So space was what he gave. This continued the traditional Scythian ''defense in depth'' strategy! Subsequent leaders - Gorbachev, Yeltsin, and Putin after them - continued this as well. The one common thread uniting Russian leaders over the past quarter-century has been the belief that without a fundamental remake, Russia would not survive, and the only way to gain the tools necessary for that remake was to give up influence. Consequently, everything - from Cuba to Poland to Afghanistan to Vietnam - was surrendered, set free or otherwise abandoned. This was the strategy for nearly 25 years, until the loss of the Ukraine raised the specter of Russian dissolution. The Russians have now stepped away from the Andropov Doctrine, abandoned the implicit bargain within it, reformed the government under the leadership of pragmatists loyal to Putin, and have begun pushing back against American and Western pressure. Demographically, the country is in terrible shape: their population is growing simultaneously older, smaller and sicklier. The number of Muslims is growing, while the number of ethnic Russians is declining. Nearly all of the economic growth that has occurred since the 1998 financial crisis has stemmed from either an artificially weak currency or rising energy prices, and there are echoes of Soviet financial overextension as occurred after the 1973 and 1981 oil price booms. The treaty, which took force in 1991, obliges the United States and Russia to maintain no more than 6,000 nuclear warheads apiece. It expires in 2009, and the United States is not anxious to renew it. Among American defense planners, there is a belief that the vast majority of weapons in the Russian nuclear program is nearing the end of its reliable life-cycle, and that replacing it would be well beyond Russias financial capacity. From the U.S. point of view, there is no reason to subject itself to a new treaty that would limit U.S. options, particularly when the Russia of today is far less able to support an arms race than the Soviet Union of yesteryear. The weapons that will be used in the Magog Invasion, or the Battle of Armageddon, may already be in inventory today. During the 1948 Arab-Israeli War, Russia helped Israel obtain arms to fight the contingent of hostile countries that included Egypt, Syria, Iraq and Jordan. However, after this initial cooperation, relations between the two countries quickly soured with Russia threatening to attack Israel during both the 1956 Sinai Campaign and the 1973 Arab-Israeli war. Russia severed diplomatic relations with Israel following the 1967 Six-Day War, then aligned itself with Arab nationalist regimes and gave support to Palestinian militants. Russia also strongly opposed the Israeli invasion of Lebanon in 1982. Even today, Russia remains allied with Israels enemies. Putin has manipulated elections, silenced critics, and gradually tight-ened his grip on the nation. He is a former KGB officer and reports estimate that one in every four of Putins government has a background in the military or security services. In recent months, Putin has faced growing criticism for restricting democratic freedoms and concentrating his presidential powers. Once thought to be a growing capitalist ally, Russia is now returning to its Soviet roots. Putin has called on Israel to withdraw ''from all the occupied Arab lands back to the June 1967 border'' and stressed the necessity of a complete Israeli withdrawal from the Golan Heights. During the Soviet era, more than a million Jews fled Russia to escape state-sponsored anti-Semitism, and in recent years there has been a dramatic resurgence of anti-Jewish sentiment. In 2005, following a string of racially motivated attacks on Jews, a letter with several hundred signatures, including those of 19 members of the Duma (the Russian parlia-ment), was sent to Russias prosecutor-general. The letter claimed that the Jews themselves were responsible for inciting anti-Semitic violence and accused them of vandalizing and burning down synagogues to garner sympathy. It also called for Jewish organizations in Russia to be investigated and banned. Russia has further earned Israels ire by announcing plans to provide the Palestinian security forces with two reconnaissance helicopters and 50 armored vehicles. Russia has also sent its military experts and security personnel to Gaza to help train Palestinian security forces. After Palestinian terrorists fired rockets from Gaza into southern Israel recently, the Israelis found missile fragments belonging to a Russian designed BM-21 rocket. For the last four years, Palestinians had been using homemade Kassam rockets. This was the first time a factory-made rocket had been fired into Israel by the Palestinians. After losing the Mid-East foothold provided by Saddam Husseins Iraq, the Russians have been building a new axis of power based on ties with Turkey, Iran and Syria. Russia is now Turkeys second-largest trading partner, with a volume of $10 billion in trade per year; Russia strengthened ties with Iran by supplying it with nuclear-related technologies; and, Russia and Syria have made plans to increase diplomatic and military cooperation. Russia has since written-off nearly 75% - approximately $10 billion - of Syrias Soviet-era debt. Russia also intends to proceed with plans to sell SS-26 and SS-18 missiles to Syria, despite U.S. and Israeli opposition. The SS-26 is a highly mobile missile that uses satellite guidance systems to attain maximum accuracy. With a range of 180 miles, it can carry a 1,000-pound warhead to most targets inside Israel; the SA-18 missiles are some of the most sophisticated shoulder-held anti-aircraft missiles on the market and Israel is concerned the weapons may fall into the hands of Palestinian terrorists. The SA-18 shoulder-fired anti-aircraft missile uses its enhanced seeker to hit aerial targets, such as jet fighters, head-on. They have a relatively short range of 5.2 km and a maximum altitude of 3.5 km, but they can be used to destroy planes, helicopters and low-flying unmanned planes. Syria is on the U.S. State Departments list of countries that sponsor terrorism. It gives ''substantial amounts of financial, training, weapons, ex-plosives, political, diplomatic, and organizational aid'' to terrorist groups such as Hezbollah and Hamas and other radical Islamic and Palestinian organizations, many of which are headquartered in Damascus. Many experts believe that a large-scale confrontation between Syria and Israel could be on the near horizon, which makes Syrias growing relationship with nations such as Iran and Russia even more concerning. Russia may be planning to move its Black Sea Fleet to the Syrian port of Tartus. Russias Black Sea Fleet currently uses a range of naval facilities in the Ukrainian region of Crimea under a 1997 agreement that allowed Russia to continue its presence in its neighboring former Soviet republic for rent of $93 million per year. The fleet is not scheduled to withdraw until 2017, but the Ukraine has demanded that a new agreement be signed and negotiations between Russia and the Ukraine have stalled. Russia has started dredging at the Syrian port of Tartus, where it maintains a logistical supply point with a possible eye to turning it into a full-fledged naval base. Russia has also launched a modernization project at the port of Latakia, 90 km to the north of Tartus. An anonymous source at the Defense Ministry indicated that Moscow was planning to form a squadron led by the Moskva, the Black Sea Fleets flagship missile cruiser, within the next three years. The squadron would operate in the Mediterranean Sea on a permanent basis. Russia intends to sell Iran up to 30 Tor M-1 surface-to-air missiles, worth $700 million. Russia has been the beneficiary of multiple lucrative contracts to help Iran develop nuclear energy and has also been helping Iran build its nuclear reactor at Bushehr. Russia, which has veto power on the UN Security Council, has also threatened to block any attempt by the U.S. to impose UN sanctions on Iran. Next month, Part 2: Why we believe Ezekiel 38 and 39 describes the use of nuclear weapons and why we believe the Magog Invasion could happen at any time. August 2006 Personal Update NewsJournal. Source: Zeihan, Peter, Russia: What Now? Stratfor, 7/06/06. In this comprehensive overview of India, Pakistan, Iraq, Iran, Saudi Arabia, Egypt, Jordan, Turkey, Russia, China and Israel, Chuck covers the background of each country as well as their military strengths, political agendas, historical roots, religious affiliations and the roles they each play in Bible prophecy. Once thought to be a growing capitalist ally, Russia is returning to its Soviet roots. With a renovated nuclear force, a renewed sense of nationalism, and fresh alliances with other communist regimes, Russia is once again at the forefront of international politics.